Here is a unique site perfect for students who love to listen to books. 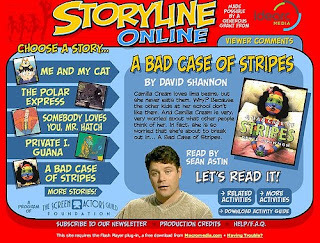 Storyline Online offers many videos of talented actors reading favorite storybooks. The video footage switches between shots of the actor reading, and shots of the book's illustrations. There are even optional captions, so that the student can read along. The site also provides lists of activities related to each book, which students and parents can work on together. All in all, Storyline Online takes a simple idea and executes it beautifully. Children of any age can listen to the storybooks. The activities are geared toward older students, probably grade 3 or so. Check it out!